Zeckos is a family owned and operated business located in Winter Springs, Florida. Since 1998, the company has grown from a one man operation to a dedicated staff of 25 individuals as unique as the items we carry. With over 30,000 items in stock and hundreds more added weekly, we truly have something for everyone. For customer service inquiries or to initiate a return, please contact Zeckos at info@zeckos.com or (407) 302-9114. You can initiate a return for new and unopened items within 30 days of delivery for a refund. To qualify for a refund, items must be in new and unused condition with all original materials and/or accessories. If a return is not received at our processing facility within 45 days, it may be subject to a partial refund. You will be responsible for return shipping costs. However, if the return is a result of a fulfillment error, product defect, or damage incurred during shipping, we will refund the full cost of the merchandise. We will provide a pre-paid return shipping label for Non-Buyer's Remorse returns. All returns are subject to inspection, and if found not to be an error on our part, the return shipping costs will be withheld from your refund. SPECIAL RETURNS INSTRUCTIONS: The Seller cannot accept returns for used items. The Seller charges a restocking fee of 20% that will be withheld from the refund. Staub Ceramic 12" x 8" Rectangular Covered Baking Dish - 12" x 8"
10.75 in. Long, 8.75 in. Wide, 4.5 in. High with an Interior Depth of 2 in..
Made of Ceramic with a Non-Porous Glossy Finish in Empire Red and White. The Lid Preserves Moisture In the Food While Keeping Your Dishes Hot and Tender. Microwave, Dishwasher and Oven Safe Up to 500 Degrees Fahrenheit. The perfect vessel for cooking up your favorite oven cooked meals, you'll love having this casserole dish handy in the kitchen! It not only looks beautiful, but it's ideal for a variety of dishes and makes your presentation that much classier. 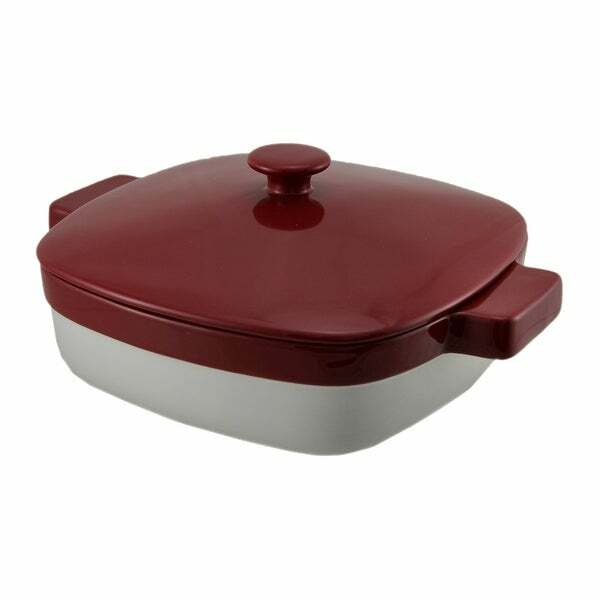 It's made of ceramic with a glossy empire red and white non-porous coating, and it heats quickly and distributes the heat evenly for perfectly cooked dishes. The lid retains heat and traps in moisture, keeping your dish hot and tender. Since it's commercial quality, it's durable enough to withstand most any cooking situation, from casual dinners to formal parties, and can go from the oven to the table with ease. This 10.75 inch long, 8.75 inch wide, 2 inch deep baking dish holds 1.9 quarts and is oven safe up to 500 degrees Fahrenheit. It's also microwave and dishwasher safe, making clean up a breeze! Dimensions 10.75 In. X 8.75 In. X 4.5 In.